Roadside safety edges are being built on the A285 between Halnaker and Petworth to give drivers more chance of staying on the carriageway if they lose control of their vehicles, with road planings, soil and other materials recycled for use on the scheme. 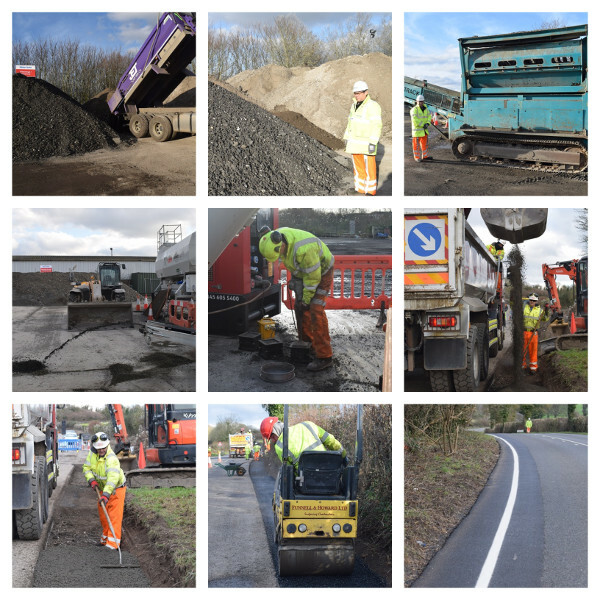 West Sussex Highways project manager Simon Osborne said: ‘The new safety edges are created by planing and excavating a 1metre-wide strip along the existing carriageway and verge. But instead of the road planings, soil and other materials going to waste, they are taken to our highways depot at Drayton. ‘There they are processed to separate the various parts, including stone, sand and soil, put into a recycling machine and a binder added to the reusable material to harden it through a reaction with water. The council said that while traditional methods involve excavating to a depth of half a metre, the strength of the hydraulically bound material allows for a shallower depth of material, saving time and cost and reducing the risk of disturbing buried services, such as pipework, within the road. Lloyd Allen, principal operations manager for Balfour Beatty Living Places, said: ‘We estimate a total of approximately 8,000 tonnes of material will be recycled over the duration of the A285 safety improvement scheme. The scheme started in October 2018 and is being funded through a £2.4m award from the Department for Transport’s Safer Roads Fund (SRF). The fund was launched in November 2016 after the Road Safety Foundation published a list of the 50 most high-risk local authority roads. The A285 between Petworth and Chichester was identified as England’s most persistently high-risk road, attracting an immediate pledge from ministers of £1m for safety improvements, followed by a further £1.5m. Last year roads minister Jesse Norman described the anticipated safety benefits of schemes funded under the SRF as ‘not only inspiring themselves but potentially agenda-setting for a next round of potential investment’. West Sussex and other councils have used the International Road Assessment Programme (iRAP) methodology to address inherent risks under a safer systems approach. The council said that more than half of the serious accidents on the A285 involve drivers leaving the road. Improvements also include introducing a ribbed edge line, similar to those found on motorways and dual carriageways. This will introduce an audible and tactile warning to drivers if they leave their lane, the width of which will also be made more consistent as part of the scheme. The work is concentrated in sections, focusing on 300m lengths at a time. The council said that, subject to factors such as severe weather, the scheme is on course to be finished by April.